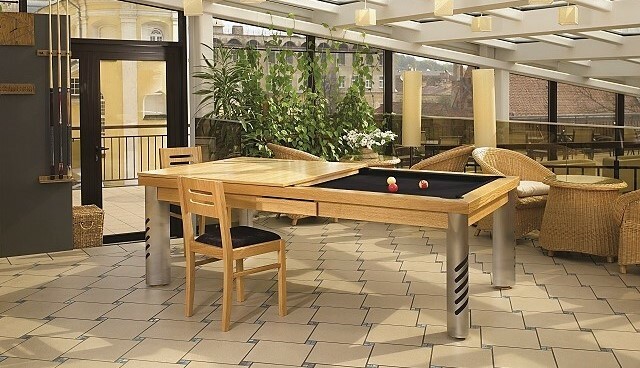 All of our convertible pool tables come with table tops. 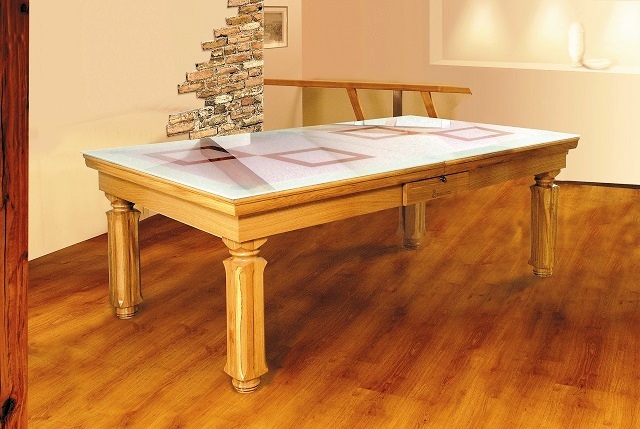 They are the perfect tables for maximizing functionality in your room while preserving its beauty. 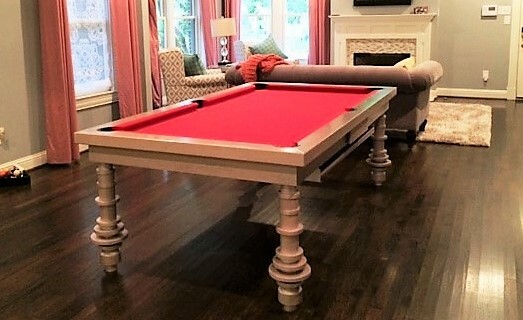 The table tops are multi-purpose. 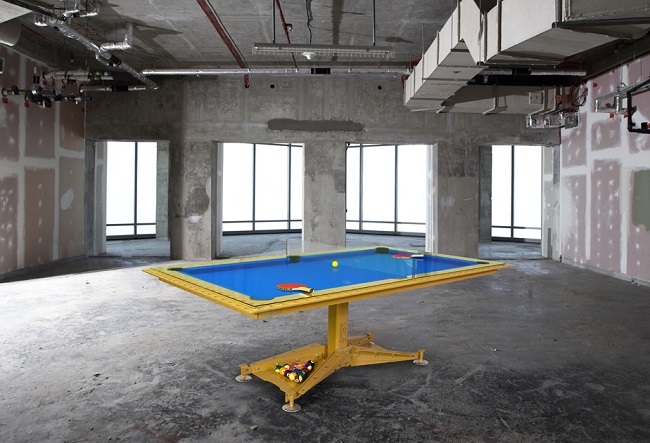 We have installed tables in residences, offices, start-up warehouse spaces, and hotels to name a few places. 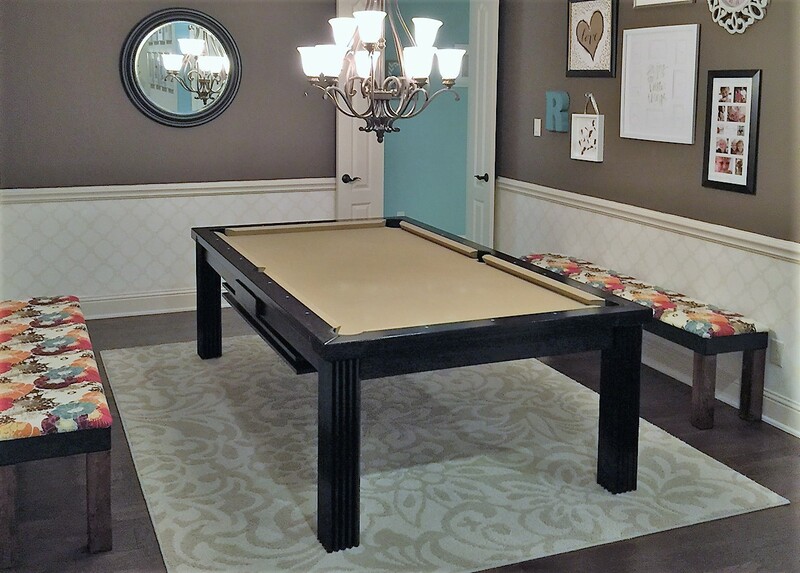 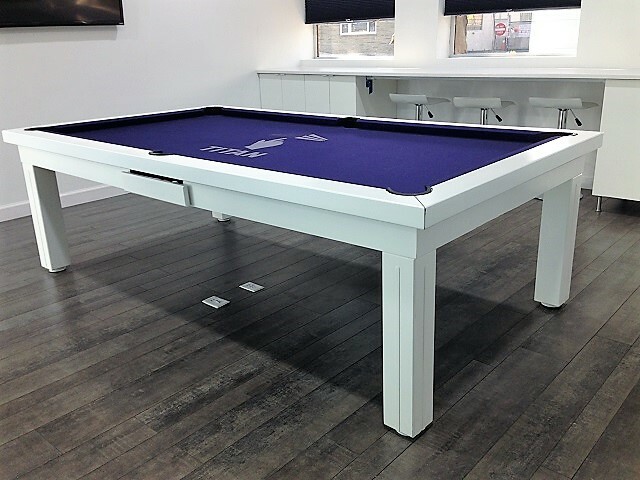 All of our convertible billiard tables (except Ultra and Decotech) are constructed from solid wood, slate and professional-grade playing cloth. 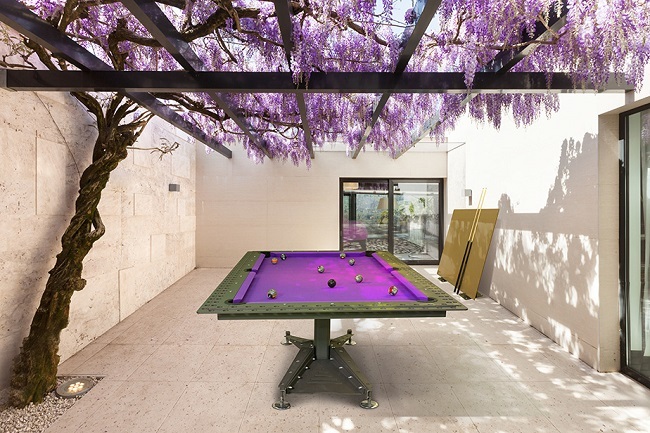 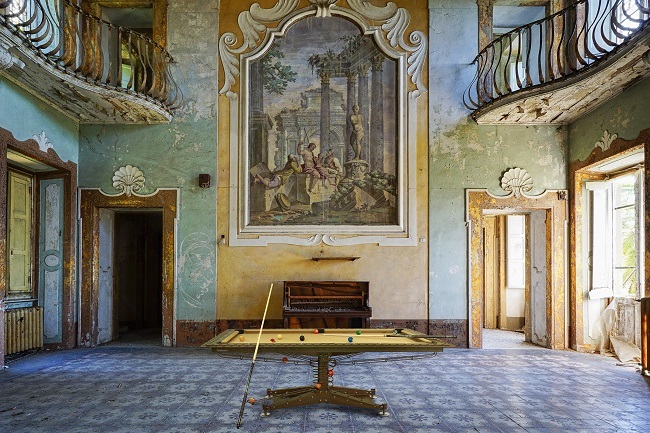 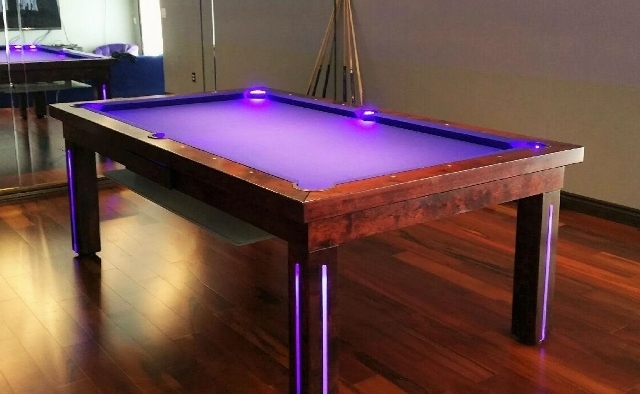 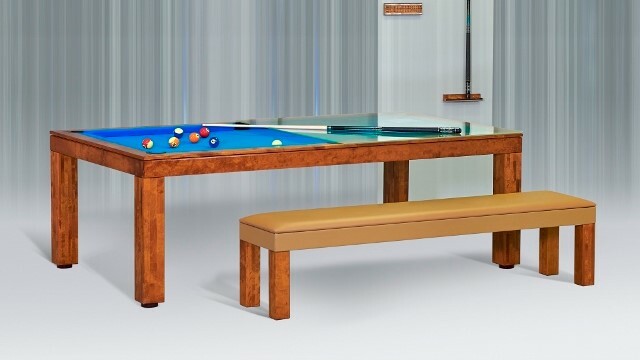 You may select from any of the cloth colors at the bottom of this page for your pool table. 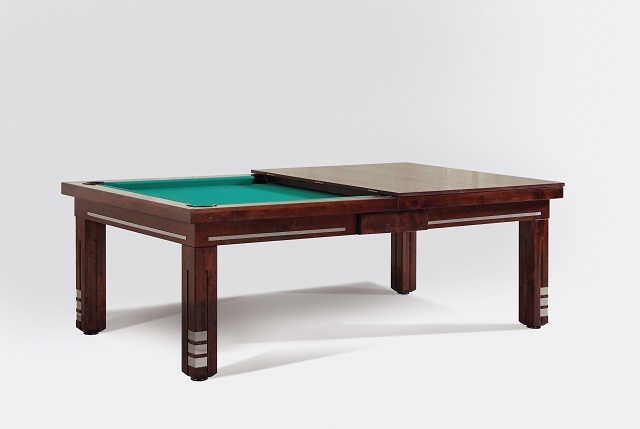 Our standard tables are available for speedy delivery. 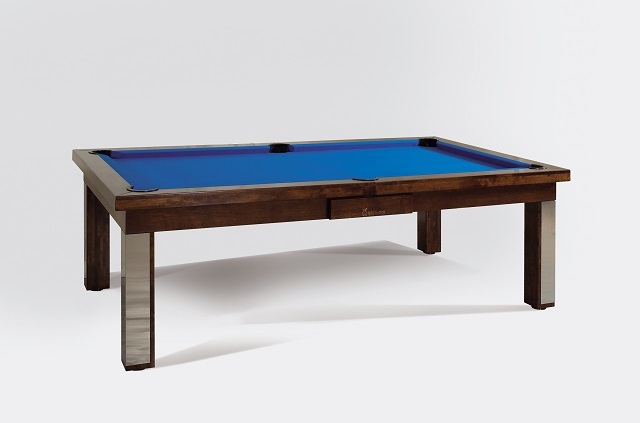 Any custom changes in stain color may affect the arrival dates of your table. 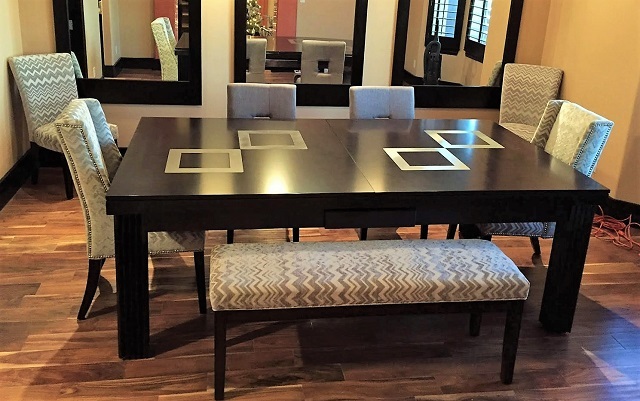 Please call us for time and cost estimates. 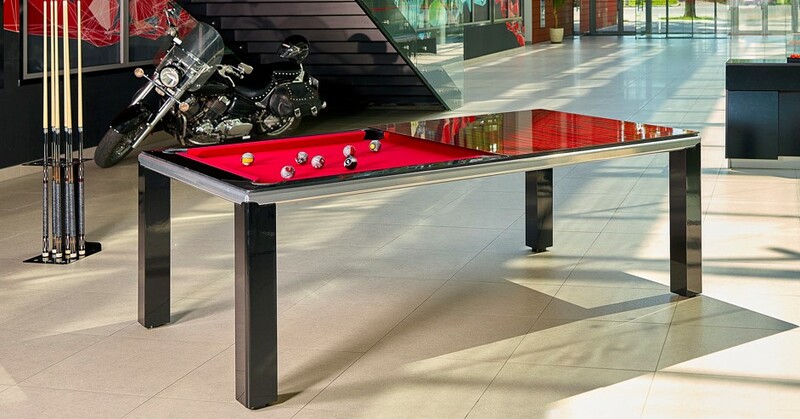 Ultra is our thinnest, an ultra sleek table that is a sure stunner that will amp up any room. 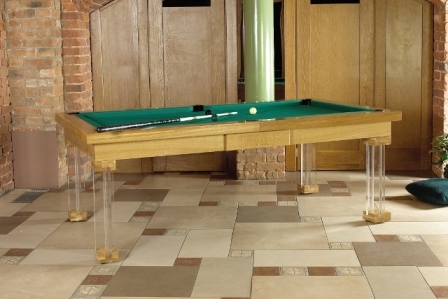 Vision is a modern design with a hydraulic lift, as well as a variety of fabulous options. 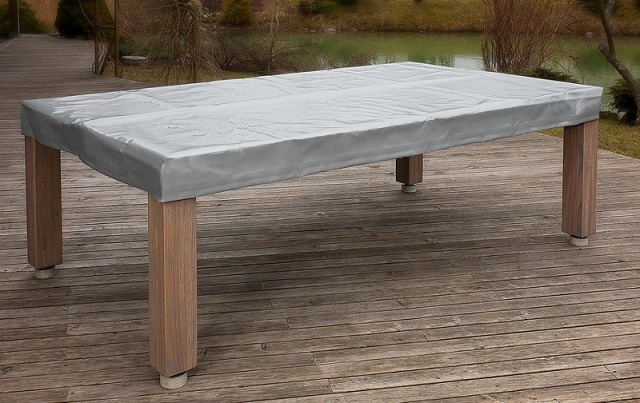 Vision Outdoor is the stunning sibling of Vision, lab tested for outdoor durability. 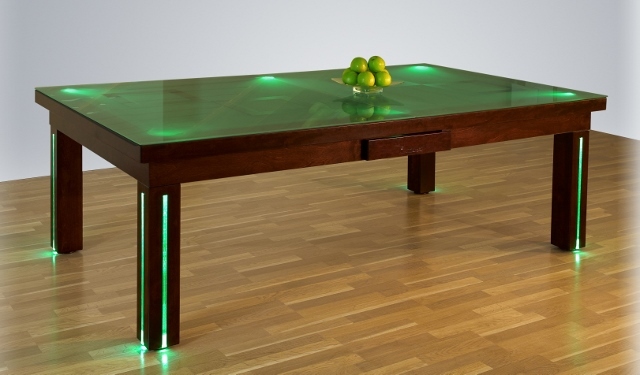 Sydney is ultra contemporary with gorgeous plexiglass legs and LED features. 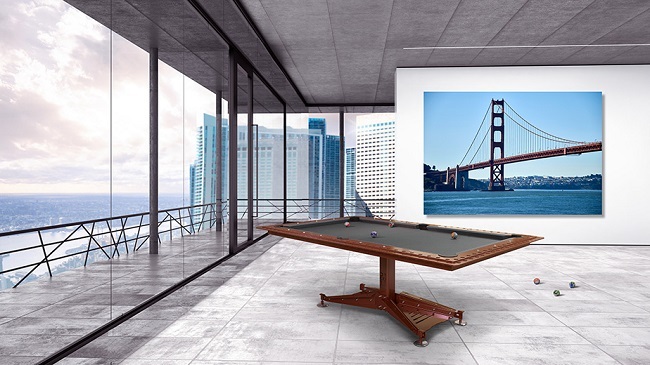 Monaco is a dynamic blend of a traditional frame with airy, modern plexiglass legs. 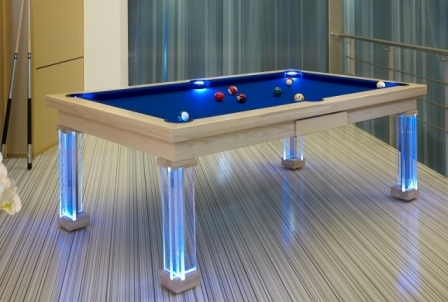 New York is a simple, refined design with a surprise twist -LED lighting. 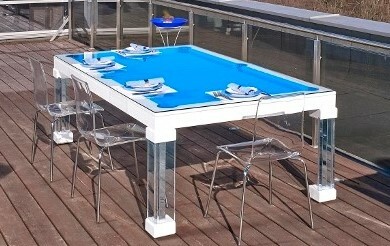 Toronto is a stunning artistic table with funky, abstract legs. 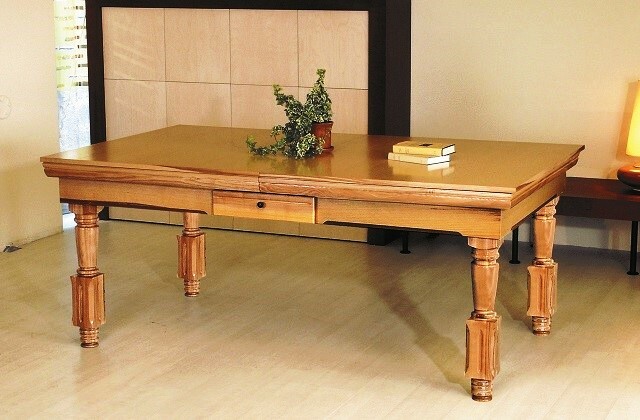 Nice is a smart, elegant table with a refined traditional look. 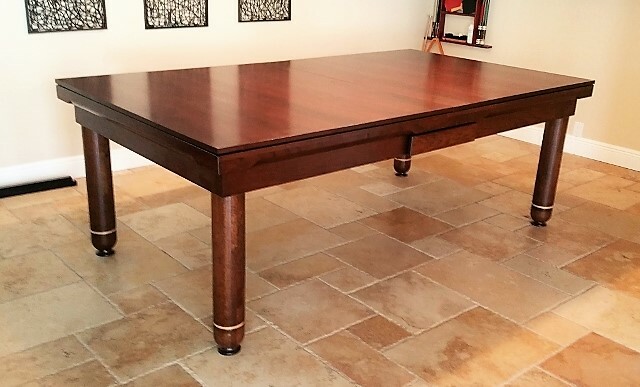 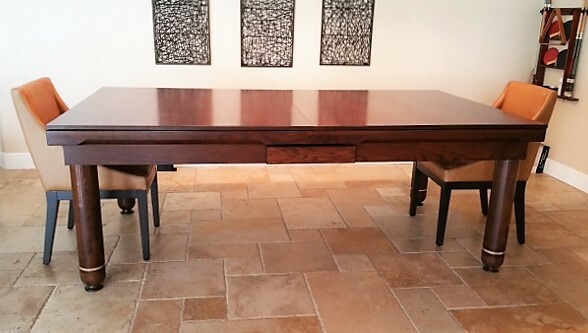 Constantine's design preserves the look of traditional American dining tables. 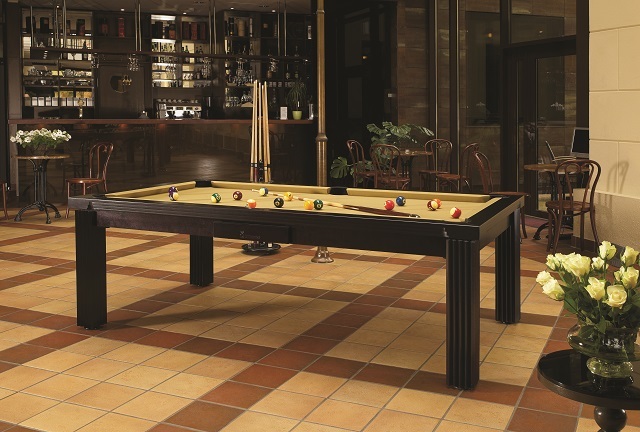 Toledo is a sophisticated and solid; masculine design. 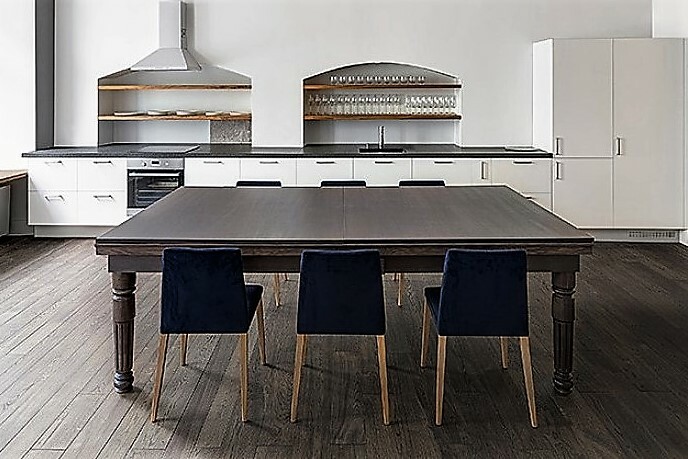 Milan's simple and classic look is suitable for almost any decor. 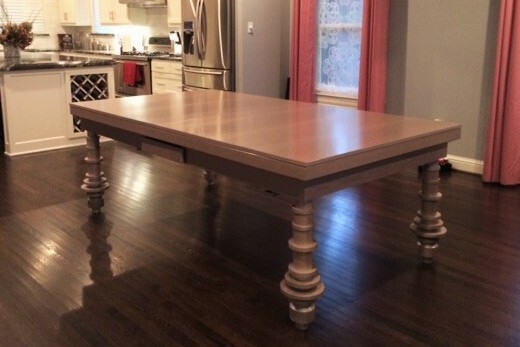 St. Merryn is a light, classic style table perfect for old charm properties. 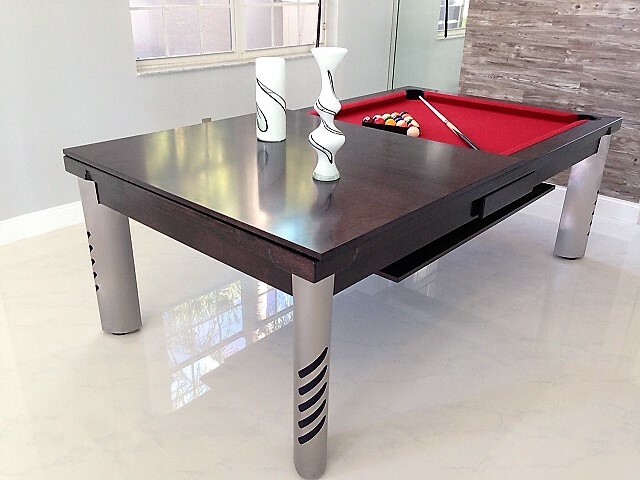 'Mirage' is designed with a European edge, blending its bold, modern metal legs and solid hardwood frame. 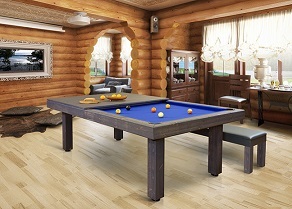 'Rustic' brings the modern feel in the log cabin dining room with the distressed "aged" wood finish. 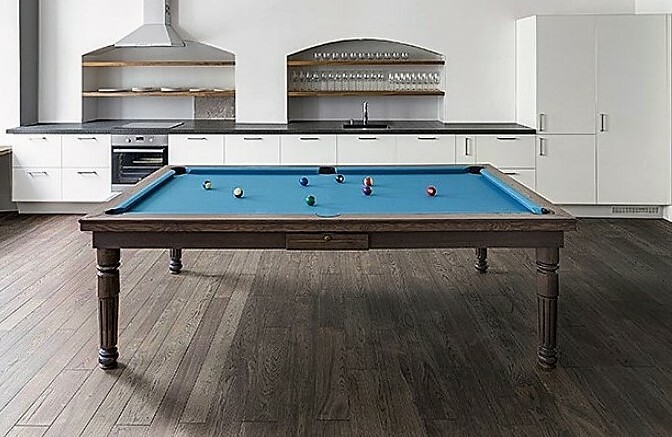 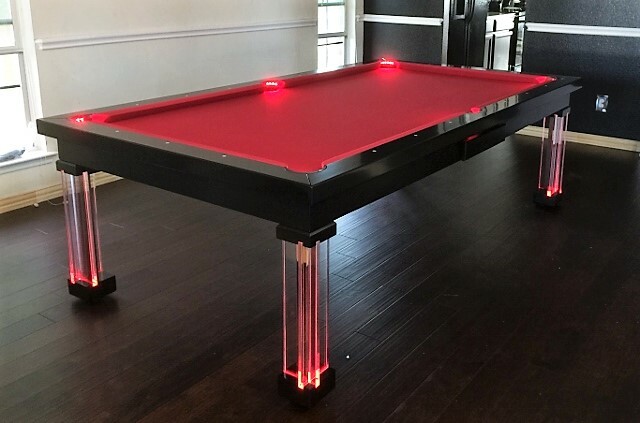 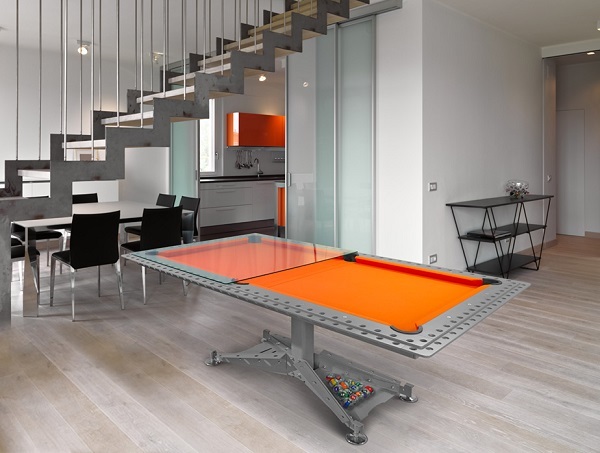 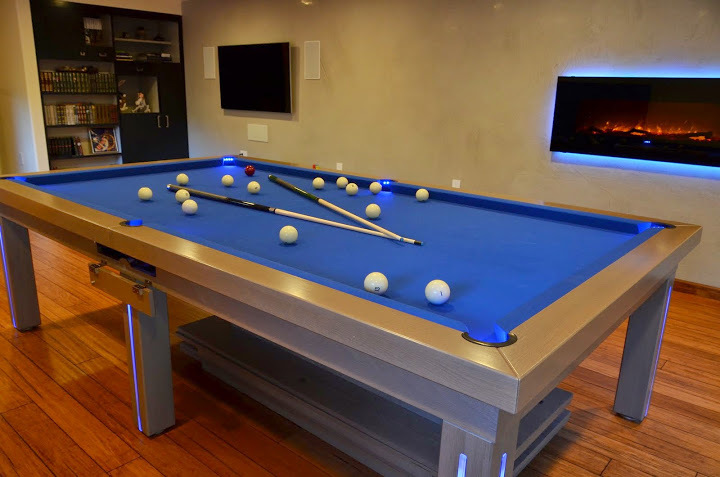 Forget the traditional old-style pool table and open your home to a new age of billiards with this industrial style pool table. 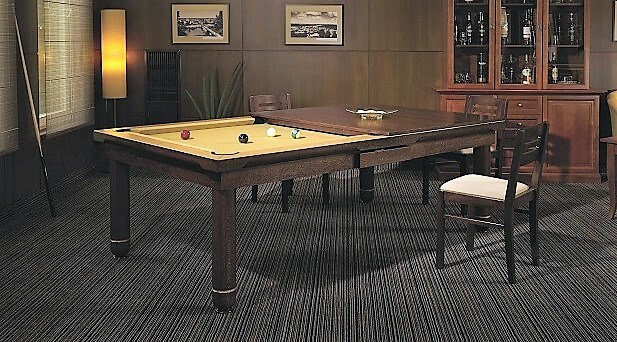 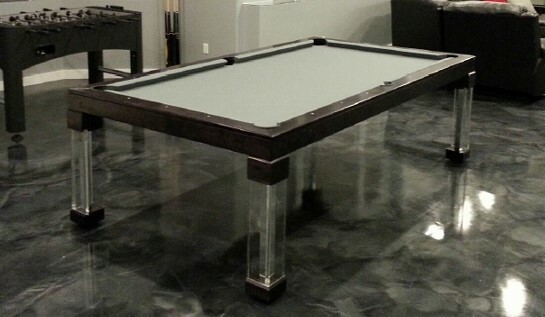 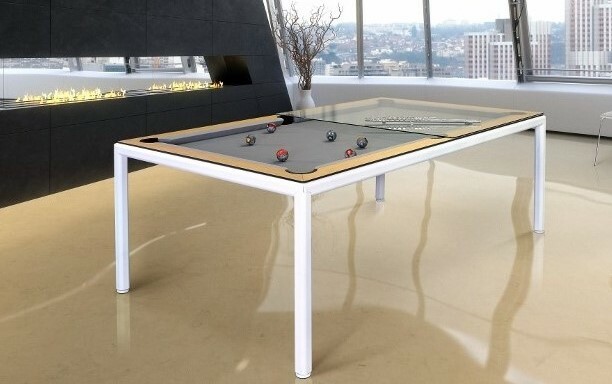 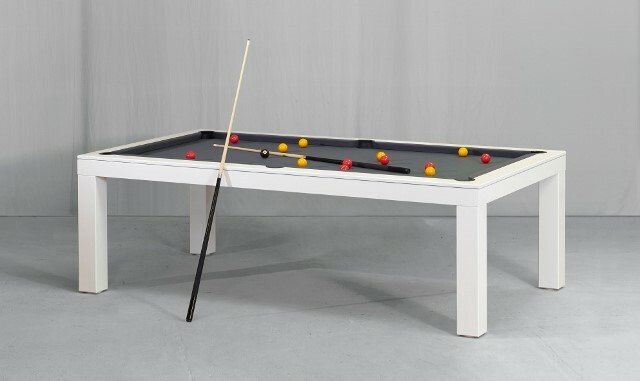 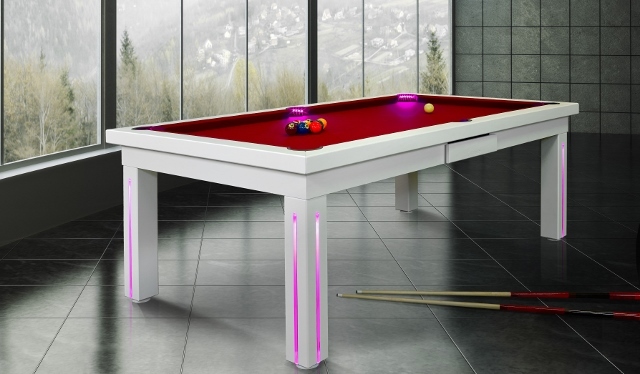 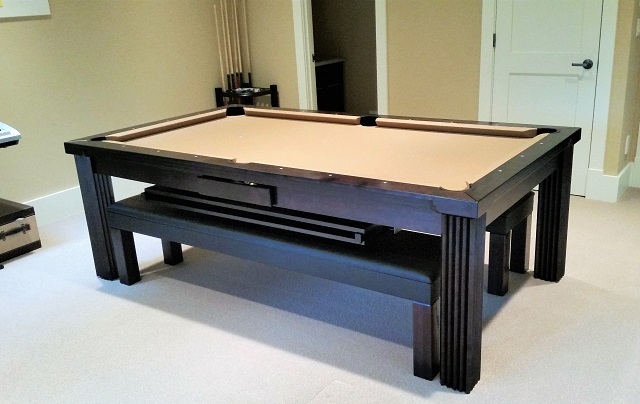 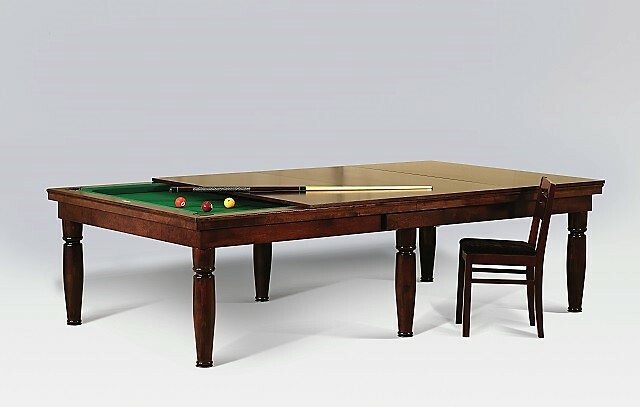 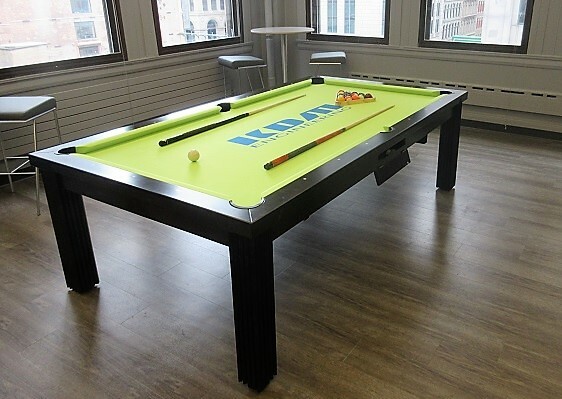 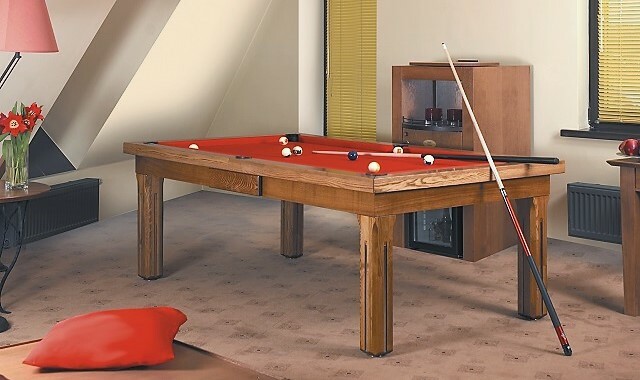 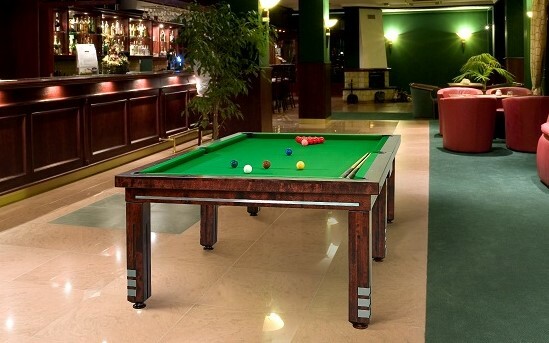 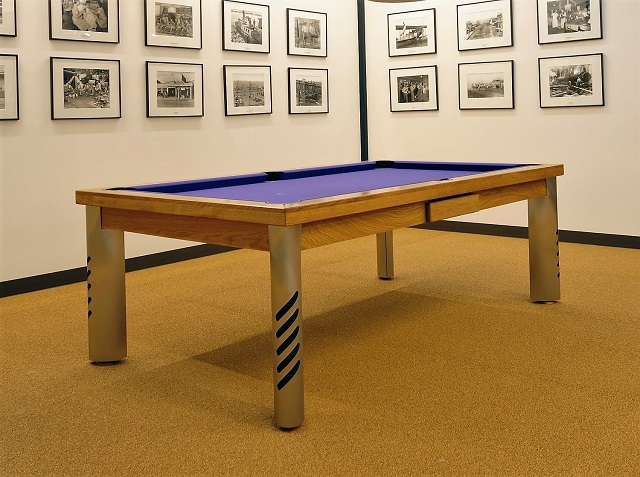 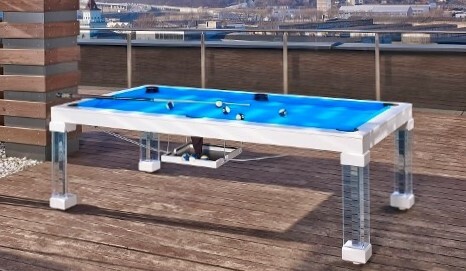 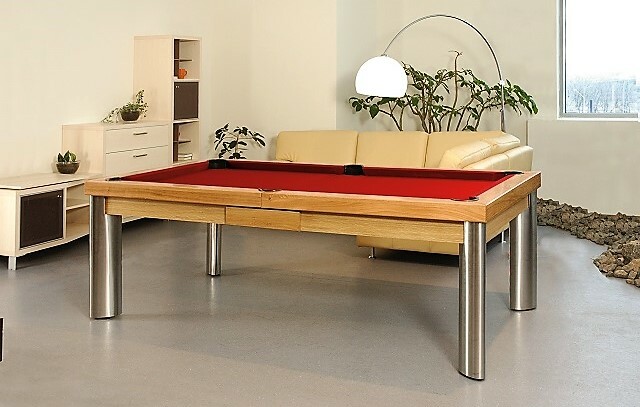 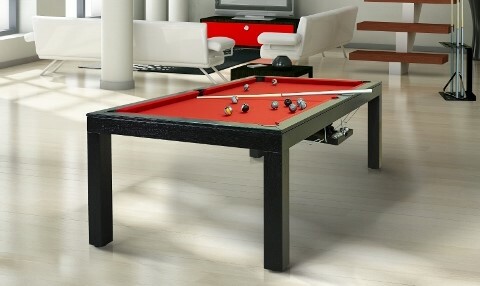 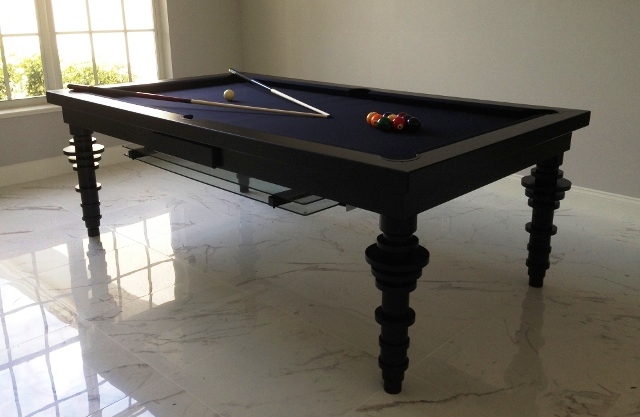 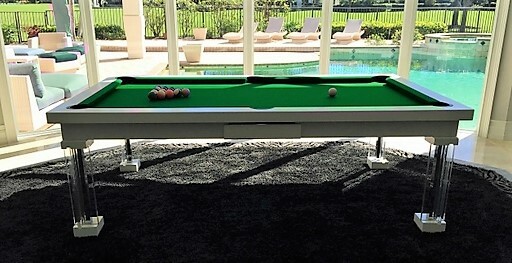 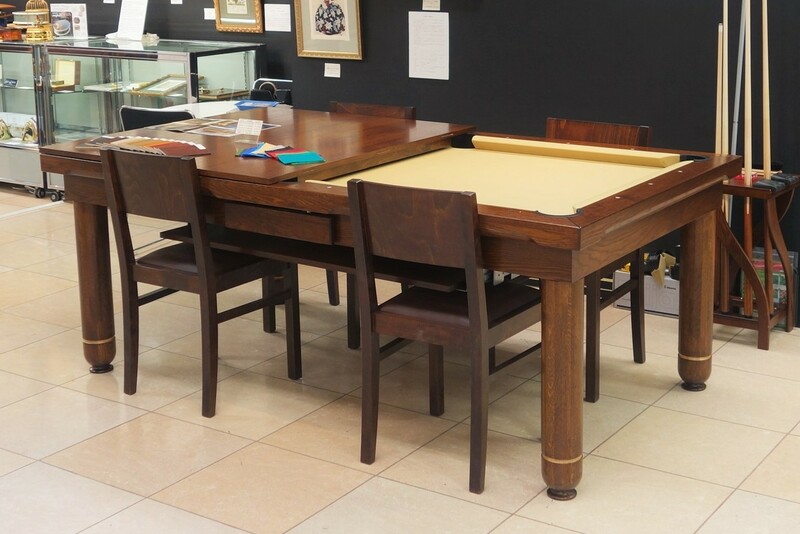 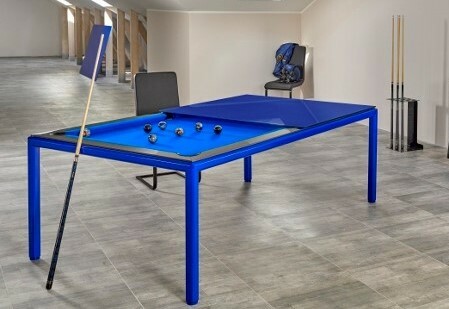 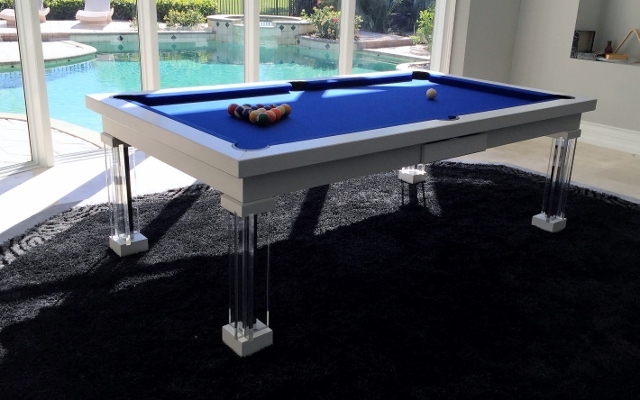 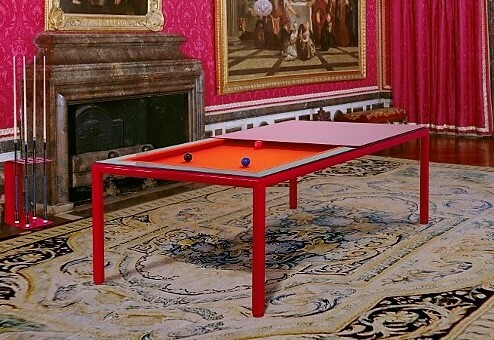 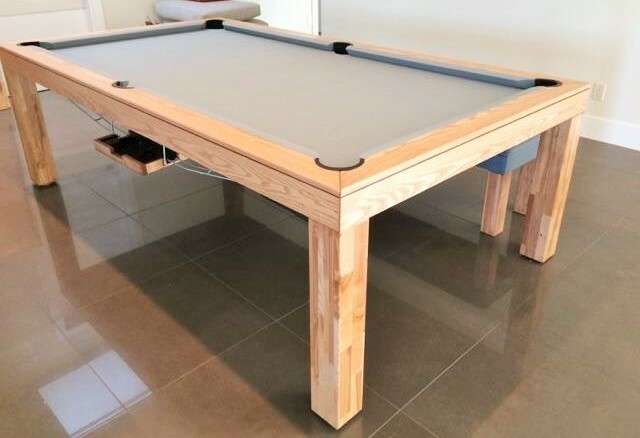 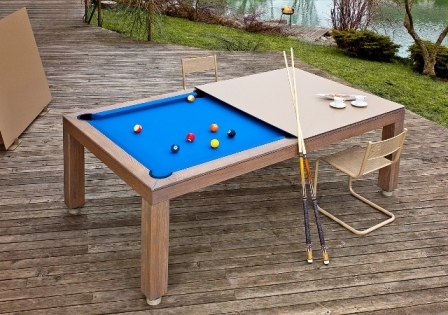 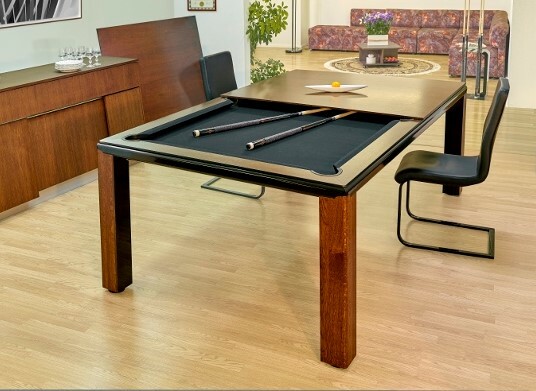 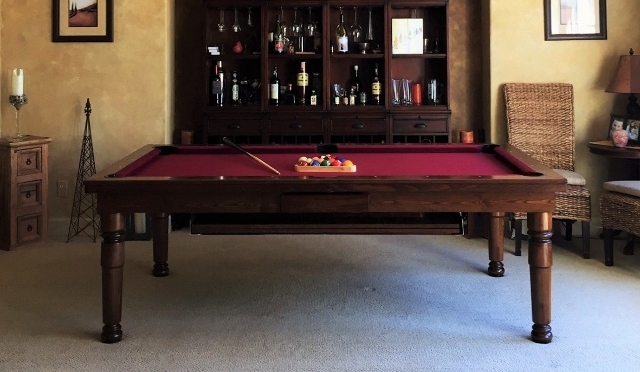 Vision convertible billiard tables quickly convert from dining or work tables to pool tables. 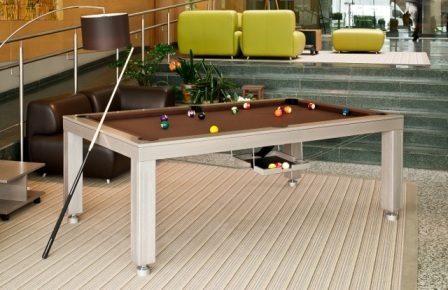 In these videos, our colleagues in Europe demonstrate how easy it is.